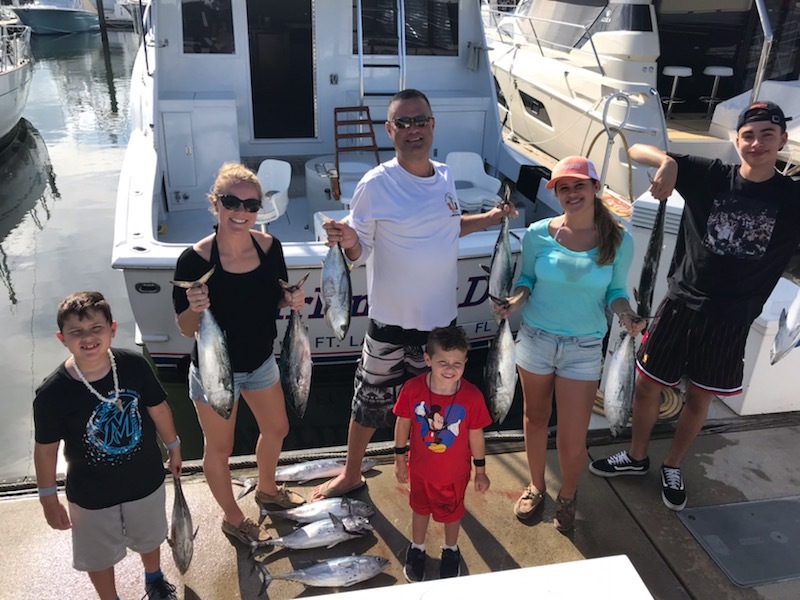 Good fishing on our Deep Sea fishing charters in Ft. Lauderdale and some pretty good weather as well. Mid 80s now and plenty of sun. A bit of a chop on the ocean but reasonable and the action along the reefs has been often very strong. 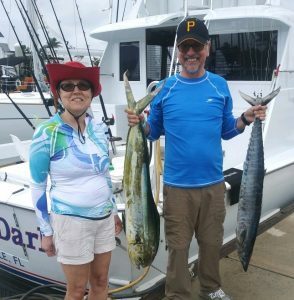 As always we have included photos of anglers who have joined us here aboard Marlin My Darlin. 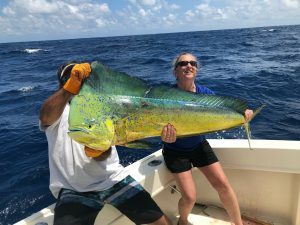 A load of small Mhi-Mahi offshore for several days but they are in reality small, very small. Most are too small to legally keep small. That is pretty small as 20 inches to the fork satisfies those who wear the badge, and I’m betting the citation book was was open more than not as there were big numbers of these “shorts” as we call them. Of course there are exceptions (few) as the big boy pictured with this report. 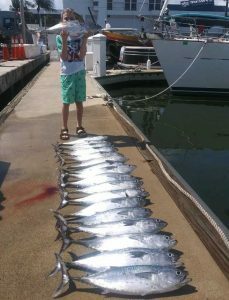 Kings have picked up on the reefs and on some days the Bonito (False Albacore) are certainly very much in the area and can be plentiful.. They are good fun and great fun for your kids for sure. 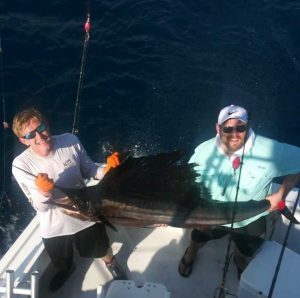 Some Sailfish, Blackfin Tuna and Wahoo around and the big Sharks continue to come through in 300 to 400 feet. Decent Golden Tilefish available smack on the bottom out in that water exceeding 700 feet. All in all most days are offering pretty good action and this improved fishing over a couple of weeks back is a welcomed change. Weatherman is calling for good weather and we’re looking forward to the coming days. We’ll post again in a few days. See you on the rip.